Modern day saving in the 21st century is not about putting money in the bank and wait for dividend. Modern day saving is "Fixed deposit". I am not an expert but everyone should know this and make it a practical lesson. Fixed deposit is not a new term or something confusing. It is just a logical way for bank to put more money into your savings while set a rule on the money. The rule is you have to place RM1000 for a period of time. It can be 2 months for the bank to invest and give you a return of investment. If I can learn more about economy which I would as well as all the people out there, Fixed deposit has always been fighting the inflation rate. Inflation rate is price goes upward without any sign of going down. It can be like a slow music but it never stop playing. Salary earners must embrace fixed deposit as a solution for the coming price increase of common goods the recent one would be the cooking oil (2016) ! Maybank is a friendly bank with little or not deposit in opening bank account. In fixed deposit investment, RM1000 for two months is a practical way to kick start your way ward off nation's inflation rate. The return of investment is 3% annually. In a correct assumption that RM1000 will yield RM30 in a year. RM30 must divide by 12(annual) in order to calculate monthly yield. The yield of one month is RM2.50 only. There are 4 options to select in fixed deposit investment. Maybank2u offer hassle free choice crediting all your returns into the same account. As depicted above, Jun 1, 2017, there were two fixed deposit investment in same day. RM1000 for two months locked till maturity on August 1, 2017. Two months maturity and RM1000 yields RM5.00 for both return of investment in Malaysia 3% fixed deposit investment. 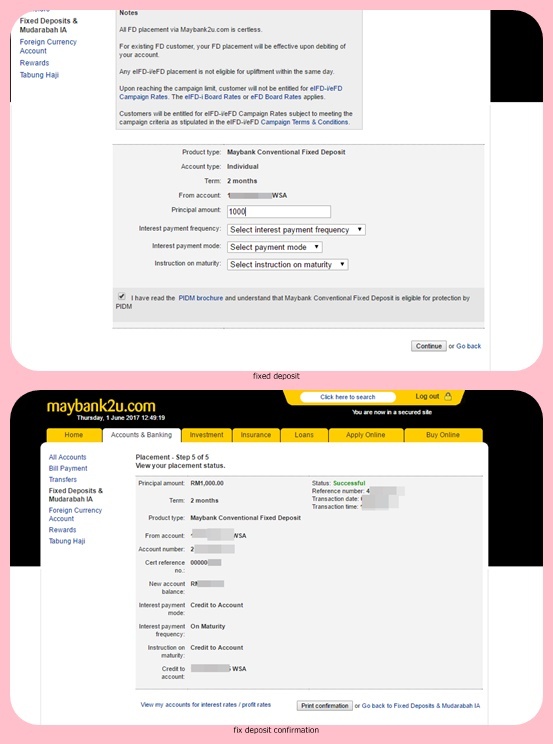 In conclusion, I got RM10.00 just by mouse clicking taking few minutes using Maybank2u service. On contrary, I risk my savings locking up RM2,000 for 2 months. In any case of unforeseen circumstances, as if I need the RM2,000 back, all I need to do is few mouse click away to retrieve it back but it will be at your loss. A new and easy way for the investors looking to get something easily from their invested funds. I will share it with some of my friends and hopefully they might consider this.